Do you want to know how to watermark photos with transparent watermark? 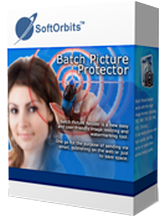 Batch Picture Protector is a right solution for you. It can watermark photos and artworks by adding visual watermarks that can combine text, illustrations and logos. This watermark software is very useful to designers, artists who send artworks to customers for evaluation. Those who publish pictures on internet can also copyright photos using this watermark maker. By using this software, digital photos can be effectively protected from illegal use. This photo watermark utility places visible watermarks that cannot be removed.